In this step, you will launch an AWS CloudFormation template that deploys Trend Micro Deep Security into your existing VPC. 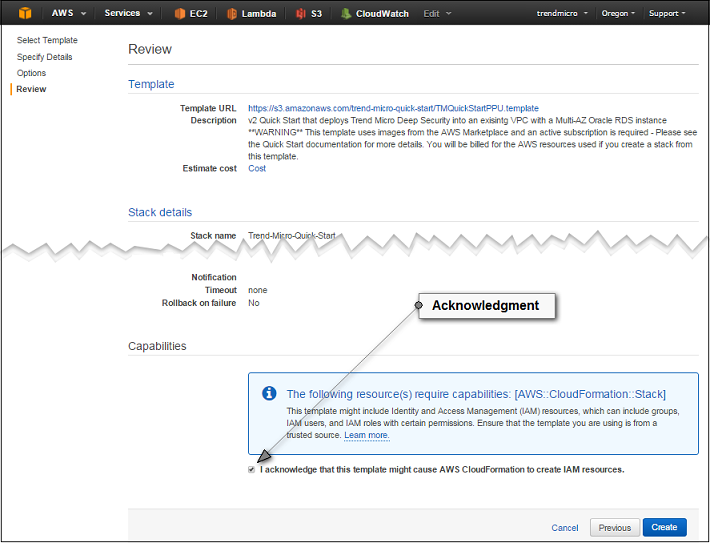 Use one of the following links to launch the AWS CloudFormation template. Choose the Per Protected Instance Hour template or the Bring Your Own License (BYOL) template, depending on the subscription you selected in step 2. The template is launched in the US East (N. Virginia) region by default. You can change the region by using the region selector in the navigation bar. Each stack takes approximately one hour to create. You are responsible for the cost of the AWS services used while running this Quick Start reference deployment, and licensing fees for Trend Micro Deep Security. There is no additional cost for using this Quick Start. See the pricing pages for each AWS service you will be using in this Quick Start for full details. On the Select Template page, keep the default URL for the AWS CloudFormation template, and then choose Next. On the Specify Details page, provide the details about your Amazon VPC and how you want Deep Security to be deployed in it. Administrator username for Deep Security DeepSecurityAdminName MasterAdmin The user name for the Deep Security administrator, for web console access. EC2 Key Pair for SSH access AWSKeyPairName Requires input The key pair that will be used to launch the EC2 instances that contain the Deep Security Manager. This key pair can be used to create an SSH connection to your Deep Security Manager. VPC for Deep Security Components AWSVPC Requires input The VPC where the Quick Start resources will be deployed. This VPC must contain two private subnets and one public subnet with a connected internet gateway. Public Subnet for Deep Security Managers DeepSecuritySubnet Requires input The subnet to deploy the Deep Security Manager and load balancers in. This subnet must be in the VPC specified by the VPC for Deep Security Components parameter and must be a public subnet with an attached internet gateway. Primary private subnet for RDS DatabaseSubnet1 Requires input The private subnet where the Amazon RDS database will be deployed. This subnet must be in the VPC specified by the VPC for Deep Security Components parameter. Secondary private subnet for RDS DatabaseSubnet2 Requires input The private subnet where the Amazon RDS database mirror will be deployed. This subnet must be in the VPC specified by the VPC for Deep Security Components parameter. It must also be in a separate Availability Zone from the Primary private subnet for RDS. Quick Start S3 Bucket Name QSS3BucketName aws-quickstart S3 bucket where the Quick Start templates and scripts are installed. Use this parameter to specify the S3 bucket name you’ve created for your copy of Quick Start assets, if you decide to customize or extend the Quick Start for your own use. The bucket name can include numbers, lowercase letters, uppercase letters, and hyphens, but should not start or end with a hyphen. Quick Start S3 Key Prefix QSS3KeyPrefix quickstart-trendmicro-deepsecurity/ The S3 key name prefix used to simulate a folder for your copy of Quick Start assets, if you decide to customize or extend the Quick Start for your own use. This prefix can include numbers, lowercase letters, uppercase letters, hyphens, and forward slashes. The BYOL template requires the following additional information. Deep Security License Key. May be left default to enter key after deployment LicenseKey Optional Enter a license key, if you have one. If you do not have a license key, please leave this parameter blank and enter your key in the console after launch. Choose the backend database DatabaseEngine PostgreSQL The database you want to use for Deep Security. You can choose PostgreSQL, Oracle, or Microsoft SQL Server. Administrator username for RDS Instance DatabaseAdminName dsadmin The user name for the Amazon RDS administrator account. When you finish reviewing and customizing the parameters, choose Next. On the Review page, review and confirm the template settings. Under Capabilities, select the check box to acknowledge that the template will create IAM resources. Deep Security requires this access to be able to see your AWS instances and protect them. console. Monitor the status of the stack. When the status displays CREATE_COMPLETE, the Trend Micro Deep Security deployment is ready.